A skyscraper warehouse with drones flying to and from your home. Patents don't mean anything right up until the moment that they mean everything, so take it as read that none of this could happen. 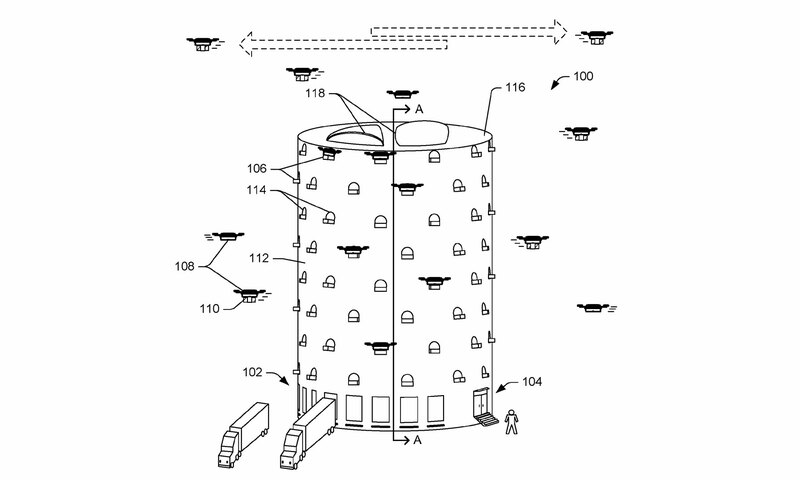 Amazon has, however, registered a patent for a concept that it's calling a "Multi-Level Fulfillment Center for Unmanned Aerial Vehicles." Which is a fancy way of saying that it wants to build enormous cylindrical warehouses at the heart of towns and cities. Rather than delivery folks driving parcels to your home, the building will be jam-packed with drones, which fill fly in and out of the location's many windows. As much of an eyesore as it would be, Amazon's idea does solve a few fairly obvious problems with being a logistics company in a city. After all, warehouse space requires plenty of land, which is at a premium in a dense urban environment. A vertical building would eliminate some of that issue, while robots and human pickers roam the floors selecting the right Blu-ray for the drone to collect. Hell, imagine the dystopias, a few generations later, as post-apocalyptic humans worship those shining towers that provide food and clothing with its army of flying robots.